Trampolines are known for causing large areas of grass to not grow underneath them. The reason for this is because of the black material trampolines use prevent sunlight from going through to the grass below, so it doesn’t grow. After a while the grass under the trampoline starts to die and becomes an eye sore. What to do. There are many choices that we have seen done such as putting the trampoline on a mulch or pine bed or even using gravel, but that doesn’t look much better than dead grass. What seems to work best is artificial grass. 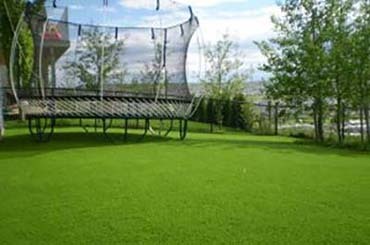 Synthetic grass truly is the perfect solution for any area where grass doesn’t grow, including the space under your trampoline. No matter how large or small the area is, you can count on the grass staying green and beautiful. 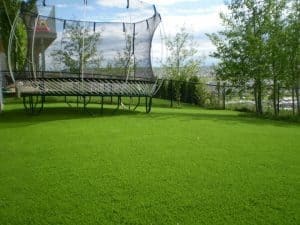 Also, ProGreen’s artificial grass is ideal to surround sunken or in-ground trampolines, which is a trend we have been seeing a lot of recently. The question is do you just want to have it under the trampoline to keep that green look all year round or extend it and make a safe playground area. If you are interested in having all or even part of your backyard converted to a artificial turf area, call us at (303) 829-3374 or email us here.